Every award winner will receive a free PDF of their Award Certificate. 1. Scoring Awards are PDF Certificates which are included with the filmmaker's scoresheet and judges comments on the scoring notification day. These are non-competitive and are based on the scores of three judges who screen and score each film, as well as cast and crew individual achievements. 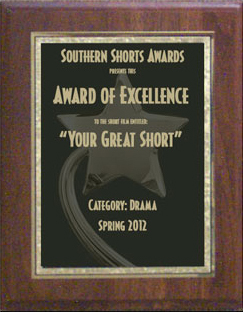 Films must receive a minimum averaged score of 70 to receive an award and individuals must receive a minimum averaged score of 7. You will not receive laurels with these awards and are not authorized to use our laurels unless we have sent them to you. 3. Laurels will ONLY be granted to those films which are actually screen at each festival. Even then, you must use the laurels as supplied without making your own modifications. You may only use laurels if we have supplied them to you, however, you may post your scoring award certificates freely. All festival awards are given out at the Awards Presentation at the end of the screenings. This is a black-tie optional event with a host who will show shorts clips from each nominee, then open the envelope and announce the winners. Each winner present can come to the podium to receive their award and the entire event is videoed and available on our website the following week. We also give Best Of Show trophies for Best Picture, Director, Screenplay, Actor, Actress, Cinematographer, Editor, Sound Design and Music. 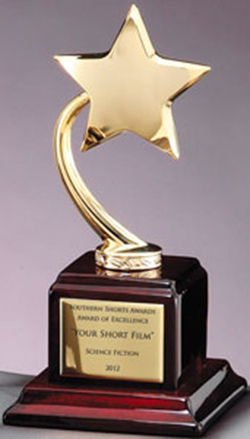 If you cannot attend or send someone to accept your films' award during the festival, you may have your award sent to you after the festival by paying a fee. Shipping costs are as follows and are per award. : Certificate - $10, Plaque - $20, Trophy - $30. If you cannot attend or send someone to accept your films' award during the festival, you may have your award sent to you after the festival by paying a fee. Foreign shipping fees vary, depending on destination, and are determined on a case-by-case basis. Whether you film is screened or not, you may order a copy of your film and individual awards as a Certificate, Plaque or Trophy at our store. 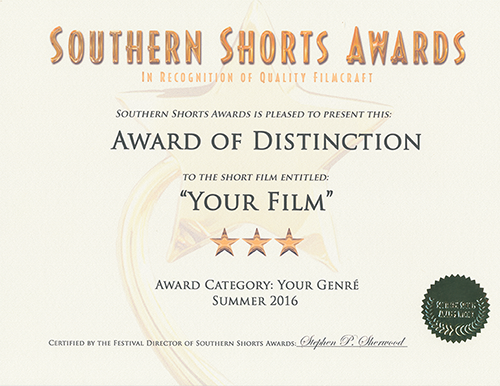 Anyone who has ever received an award from our festival is also eligible to order our Award Winner pins. Check out our Awards Store by clicking on the certificate below. Award Winners have the option of purchasing an Award Certificate printed on 8.5" x 11" cardstock fo $20, a wall plaque for $50 or a trophy for $100, plus shipping. These pictures are for illustration purposes only and the actual plaque and trophy may change without notice.